Acer Aspire 3628AWXCI – There Ain't No Cheaper? Acer is one of the largest Asian manufacturers of computers and components, including notebooks. Acer is now actively expanding practically to all world markets, including the European and Russian ones. One of significant points of this strategy is offering cheapest products to maximum consumers. That is one of key points of Acer's strategy is to offer a notebook to a consumer at the lowest price possible (you should take into account that it's not always so, functional models from Acer are no cheaper than their counterparts from other manufacturers) on the market. And this strategy really works - Acer is currently one of the leading players on the Russian market of notebooks, its market share has grown much of late. Home users are unorganized beings, they easily yield to a simple temptation "Oh! A notebook for just $700! I'll take it!" Let's try to find out what a user gets for this money and whether you should pay extra money for more expensive models. Or does a notebook for $700 have everything necessary for comfortable operation, everything else being just over-indulgence? The Aspire 3620 series, which includes the model under review, provides enough functionality for a minimum price to an unpretentious user. Its description on manufacturer's web site. 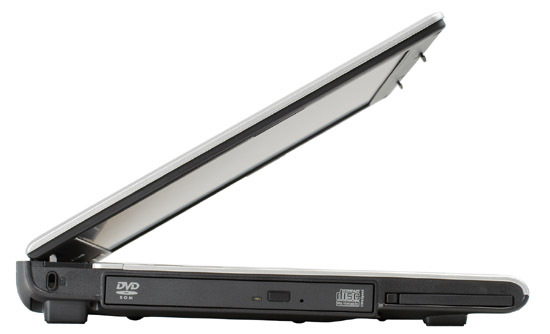 Aspire 3620 notebooks are compact representatives of the line of modern desktop replacements. This series offers an optimal price / functionality / mobility ratio. 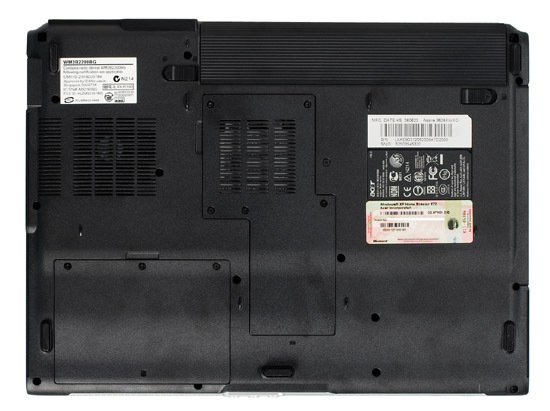 Aspire 3620 notebooks are based on Intel® Pentium® M, DDR-2 memory, and equipped with a wide 14.1" WXGA display, a built-in optical drive, and a wide assortment of ports and interfaces, including a wireless one. Our lab got hold of Acer Aspire 3628AWXCI, the only available model at this moment. Acer has a large Russian web site with a ramified catalog. Aspire 3628AWXCi belongs to the Aspire 3620 series, it's an only model in the series. You can read a detailed description of this 3620 series here. Configuration of this model is published here, on the page that describes the series. Warranty for the tested model is one year. The Drivers and Support page contains information about technical support and links to the latest driver versions. It should be noted that authorized service centers will repair your notebook, if you have a warranty ticket. 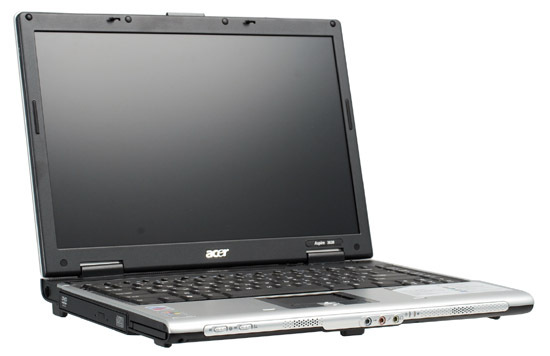 Otherwise Acer warns that it will be up to the vendor. I don't know what kind of problems between the manufacturer and vendors caused this warning. I only want to note that it's no good to consumers. Especially as I have often met posts about sales of blank warranty tickets. So it's as usual - these limitations make the life more difficult for honest users, but have no effect on other people. You can read about the warranty here. The list of authorized services is published here. The same page contains information about drivers and updates. We used the standard Windows profile for our tests - "Portable/Desktop". Display brightness was set to maximum. According to test results, the battery is 44000 mWh. Test results for reading 254 min. The system demonstrates more than adequate results for its price, I would say that the 3628 is getting close to leaders of the market. This battery life is quite sufficient even for most mobile users. The 3628 owner shouldn't be concerned with battery time, it will be enough for most cases. The keyboard produces a nice first impression. We have absolutely no gripes with the layout – even the left ctrl button is in the corner (frankly speaking, I am so used to notebook keyboards that I even fell out of the habit, but it's definitely an advantage when you also work with a desktop keyboard; besides, this layout is more convenient to switch between languages using ctrl+shift), so you'll get used to this keyboard very quickly. All the keys are grouped logically, Del is placed in the upper right corner, which is also convenient for editing texts - you can easily find it by touch. There are lots of Fn combinations, you can see them on the photo. What concerns the tactile feedback, it's a catastrophe. The entire keyboard moves. Besides, the keyboard seems to be installed with a hump. The central sag is approximately 3 mm. Each time you press a button, the keyboard jumps up and hits your fingers. The keys are too soft, accidental key presses are quite possible (you may weigh down a button accidentally, when your hand just lies on the keyboard). But the soft keyboard is good for typing – it's less tiring for your hands. Only the right side is more or less firmly fixed. So it's unpleasant to type, the keyboard strikes your fingers back. As far as I understand, it's a common situation among such models. It's actually typical of blind typing only. For example, my relatives, who type with two fingers only, feel no difference between various types of keyboards. They are all the same to them. The touch pad is smooth. Sometimes the mouse pointer follows your finger with a delay, but I have no special gripes with it. The touch pad contains two usual buttons (they are hard to press and click audibly) and a four-way scroll button. It's a mediocre solution, but it will do. 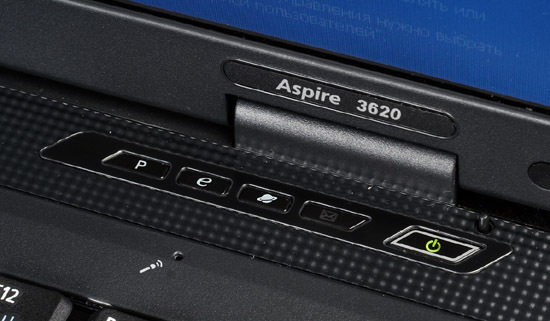 Aspire 3628 has four additional buttons near the power button. By default, the buttons start an e-mail client, Internet browser, Acer utilities. There is also one vacant button. The buttons are small, flush with the case. They are not very convenient to press. The buttons are painted carelessly (especially the e-mail button). There are two sliders on the front panel to activate WiFi and Bluetooth. The sliders cannot be locked (it's inconvenient) and have a backlash, it's unpleasant to use them. You cannot feel when the slider activated its function. Activation of the interfaces is indicated by LEDs near the sliders. You can disable them using the Acer utilities, it cannot be done on the hardware level. If you don't use the utility, the sliders won't work. The main indicators are located on the front panel and face forward. The indicators are small, you cannot see them in bright sunlight. They can light yellow or green. Status indicator: green – on, yellow – idle. Battery – green – charged/working from a battery, yellow – charging. The case produces a nice impression, it looks great for a cheap model. You can understand it's cheap by the black plastic (especially the bottom lid), but it still does not look like trash. When open, the notebook looks good. The keyboard is also made of good plastic. It's a nice model in terms of materials. It looks more expensive than it really is. Design of the notebook is also good, it's not made like a "brick". The notebook looks proportional, its silvery and black panels go well. The touch pad is nicely decorated, black with a silvery scroll button. Side panels are "framed" to make the notebook look slimmer and more attractive. The only thing I don't like is the round front edge and that the display lid does not reach the front edge of the case. But tastes differ. The case is assembled well, no backlash or creaks. The panel can be forced in to the appearance of circles, so you should be careful with the display lid. But it will most likely survive usual handling. The main gripe with the exterior is the quality of elements. Many components are cast carelessly (for example, the sliders, the grille on the front panel that covers speakers, etc). That is small elements are made carelessly. If you look closely, your impression will be spoilt. By the way, Acer models use a number of original solutions intended to reduce their costs (by the way, we found it out in our forum; I'd like to thank one of our forum users who provided valuable information and several comments about Acer notebooks). In particular, practically all notebooks that can accommodate wireless network cards are already equipped with built-in antennas. 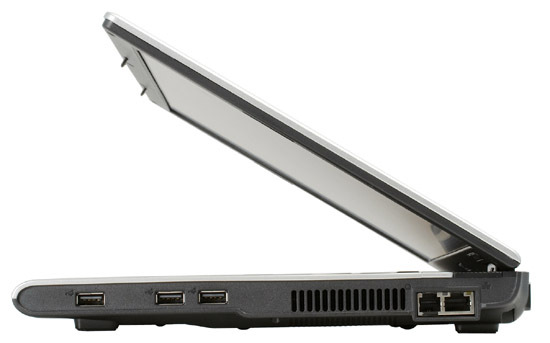 Acer's notebooks are equipped with antennas (not models , but given samples!) only if they already have the cards. No card, no antenna. It requires a new lid. The lid is not expensive. So if you plan this upgrade, you should keep it in mind. Let's examine the layout of ports and their usability. The front panel houses the sliders to turn on/off wireless interfaces, speakers, and audio jacks. I have already described the sliders. Audio jacks on the front panel are not always convenient. They are usually placed on the front panel, if it's a desktop model (I still don't understand why). Front connections are more or less convenient to plug headphones, for example, when you watch a movie reclining in an armchair. But it's not good for external speakers (there will be permanently a long plug with a cord on the front panel, which you always stumble against). It's not a critical drawback, but it should be still taken into account. The right flank houses 3 x USB 2.0, vent holes (theoretically, it blows hot air at your palm with a mouse, which is not always pleasant. In practice, the cooling system is idle 90% of the time, the air flow is weak and causes no problems), as well as network and modem ports. The left flank – Kensington lock, an optical drive, and a single PCMCIA slot. Most of the rear panel is taken by the battery. A power connector and a VGA port are on the left. Judging by the remaining room, the engineers either planned an LPT port, or this part of the case is from a previous model with this port. The bottom contains two vent grilles and two lids to access innards of the notebook. No excesses and additional devices. But it's justified for such a cheap model – if you need anything, you'll buy it separately. If not, you won't waste money on what you don't need. The notebook is equipped with a wide 14.1 panel (1280x800). The panel is rather bright, brightness adjustment range is wide. It's TN-film of the latest generation. Nothing special, but the angles of view are more or less acceptable, you can watch movies without freezing your head in a single position not to change colors. It's a normal panel for a budget notebook. The sound is similar to standard speakers in other notebooks. It's good only at high and middle frequencies, the speakers are not loud enough for a noisy room. It will do only for dialogs in movies. It does not differ from products of other manufacturers. The notebook does not grow hot in normal mode and when you watch movies, only the bottom panel gets warm. When we played an old 3D game in software mode, the right side (approximately under the vent grille) grew hot, the left side remained cold. The right side of the keyboard also grew hot, but wrist pads remained cold. The fan always operated at constant speed, the noise was absolutely no problem. Hot air blows from the hole, but the flow is weak – it's either intentional, or the fan is weak. No discomfort. HDD noise is also hardly audible. The loudest sound source is the optical drive, but it does not work much, so you can easily accept it. In my opinion, the battery time is excellent, especially for such a model. The time is demonstrated with all additional devices disabled, of course. In return, we had to uninstall all Acer utilities (they were constantly offering something, interfering with the test script). 3 hours of DVD playback is a very good result for a budget system. The notebook performed surprisingly better than I expected. It's very good for its price and will be an excellent choice for an inexperienced user, who needs a home computer for various simple tasks and has no special requirements. Taking into account that such users usually type with two fingers, even the keyboard flaws shouldn't be a problem to them. When I tested this notebook, I was constantly thinking why you should pay more money, if you were content with this model. This model will satisfy modest needs of a usual home user, who does not want anything above the average level (for example, games). I would have never bought this notebook myself, because of its horrible keyboard. But it's my personal opinion. But there is one "but"… Big "but". It's technical support. Yes, Acer does much for a client that buys a notebook for $700. For example, its proprietary utilities. But the company orders the notebooks to third-party plants, so we have doubts concerning the quality of a $700 product. I've often heard the grapevine about frequent failures of Acer notebooks. But there are lots of them sold, very often inexperienced users are very angry about any failures. But my acquaintance bought a notebook and it was in repairs twice already, both times quite for a long time. The iXBT.com forum has a long branch devoted to the 36xx series and Acer reputation in general. We shall not comment on it (you can read it on your own). But it should be noted that I have often heard bad reviews of Acer's tech support: constant problems with notebooks that are even still on warranty, long repairs, authorized service centers sometimes refuse to provide certificates of expert examination, and so forth. This information needs to be proved, of course. But still... It's up to a user to decide to buy a notebook. And all these stories can be usual scare stories. But considering their number, I decided to warn our readers beforehand. If you want to know the details, read the above-mentioned forum branch. In my opinion, it's an all-purpose notebook for home users. It can stay on your desk all the time or travel with you in a bag – its dimensions and weight allow it. That is it's not a pure desktop replacement. It's a cheap, all-purpose, and rather convenient notebook for a home user, who does not want much from it, but who wants to get an all-purpose model.